A wide ranging series of summer events and workshops up and down Northland’s east coast kept the Kiwi Coast busy through November and December. Hundreds of people participated, experiencing wild kiwi up close, gaining new ssummer kills in pest control, exploring different ways of working together and finding out about the Kiwi Coast and how they could get involved and help. Whangarei Heads Kiwi Release – November 11th. 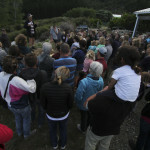 Close to two hundred people came to see Mabel and Tindall the kiwi released by Backyard Kiwi on the slopes of Taurikura Ridge at Whangarei Heads. The successful release of kiwi in this area is testament to the local community’s strong support and exemplary dog control. With reports of the monitored “kiwi dad’s” in the area now sitting on their second nests of the season after successfully hatching the first round of chicks, this kiwi stronghold continues to go from strength to strength. Learning about kiwi at the Whangarei Heads kiwi release. Bernie the Matakohe-Limestone Island Ranger at the Tutukaka kiwi release. Todd Hamilton and the Ngunguru School Trappers. Tutukaka Kiwi Release – November 19th. Bernie and Tiaki the kiwi first visited Ngunguru School, wowing 92 students and staff at Ngunguru School including the keen Ngunguru School Trappers who are working hard to keep native wildlife safe on the school grounds and surrounds. 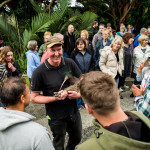 The subsequent evening release at Tawapou Coastal Native plant nursery saw 155 people gather to see the kiwi safely off to wander and breed in the area, with predators kept to low numbers by the combined efforts of the Tutukaka Landcare Coalition, Sandy Bay Kiwi, and Riverlands Landcare Group. Bay of Islands ‘Alliance’ Workshop – November 21st. Representatives from around ten community and iwi led conservation projects in the wider Bay of Islands area came together for this workshop to explore new ways of working together and look into the possibility of forming a combined entity to do so. Facilitated by Helen Moodie, the workshop provided plenty of opportunities to discuss the options and find common ground useful for building the foundations of a combined approach to pest control and biodiversity stewardship over a larger area. 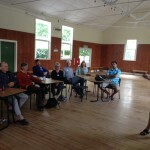 Helen Moodie facilitates the Bay of Islands ‘Alliance’ Workshop. 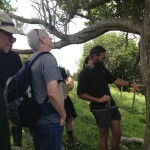 Glen Coulston points out possum marks on puriri tree. Glen Coulston demonstrates the DOC 200 stoat trap. Owhiwa Practical Pest Control Fieldtrip – November 22nd. This targeted fieldtrip was organised as a follow up to the Controlled Substances Licence course held earlier in the year to give some practical skills to back up the newly learned theories. The fieldtrip was led by Glen Coulston who shared his immense pest control knowledge and expertise with local landowners and representatives from eight Landcare Groups keen to learn the most effective ways of using controlled substances such as cyanide. 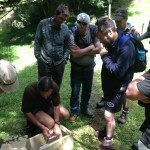 Hosted by Mark and Wendy Ewen of Owhiwa Landcare, the field trip started with a discussion of trapper health and safety, precautions to prevent the spread of Kauri Dieback disease and a look at some of products and traps available. This was followed by a walk around Mark’s trapline, which provided a great opportunity to get into the nitty-gritty of pest control, install some new traps and learn a few tricks of the trade! 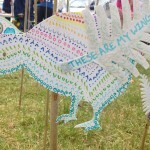 Whangarei Summer Show: December 5th & 6th. 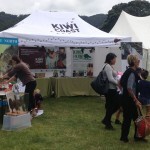 The Kiwi Coast tent at the Summer Show was a popular site with around 200 people stopping to talk about kiwi, share stories and create a kiwi for the ‘Kiwi Forest’ that quickly took over the front of the site each day. The show once again provided a great opportunity to talk with people from all walks of life, meet new people wanting to get involved in the Kiwi Coast and learn we can best support communities to look after their kiwi, wildlife and special places. 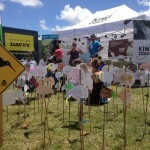 Kiwi Coast site at the Whangarei Summer Show. The next Kiwi Coast events will take place in the New Year – keep an eye on our events calendar or Facebook page to find out when kiwi are being released, register for upcoming workshops or find out when we’re in your area talking kiwi!